Now that I’m blogging items for female avatars now and again I find that coming up with creative things hasn’t been harder nor has it been easier. I am finding out that I do come up with some pretty good ideas that I might never would have blogged on my own before this time so I will take it as I can get it. I love to create visual stories to songs and sometimes it’s not always the stuff I listen to all the time or every day. It allows me to even include genre’s that I might not have considered in the past as well. Honestly I’ve never had anything against Lady Gaga prior to her turn in the remake of “A Star Is Born” in which the music is fantastic and truly shows her talents outside of the theatrics and shock value we’ve all known from her with her strange dresses and music videos. From the moment I saw the Versov “Rodeo Drive” backdrop an idea jumped into my head right away. I had some photags from a gacha that I played last year at some point and also a great pose set from one of my sponsors, Image Essentials called “Holiday Shopping” and yeah it’s not really anywhere near the holidays right now but when you love shopping any day can be a holiday so that’s what I’m going with. This set has eight different poses each with their own set of shopping bags for each hand so that you can show off how boss you are when you are out on a shopping spree. This set has been around for a while and I didn’t get a chance to blog it when it was new but thankfully I was able to do so now and also bring attention to it to maybe a new set of people who missed it when it was brand new. So I’ve checked off the Versov backdrop and because there’s not much to say about it’s features other than the fact that is a well made mesh facsimile of what Rodeo Drive looks like with the street full of shops with trees and benches. For bloggers and photographers alike it is about as realistic as can be with perfect textures so if you’re interested in taking photos of yourself browsing stores or shopping like I’ve done this is a great way to do it. Putting that aside, I have two articles of clothing I’d like to share from Native Urban that I was able to combine together to make one solid outfit and it also works since it is more of a outwear thing and because it could be considered a post-dated photo from the holidays with the shopping pose set. I’ll start at the top and work my way down of course because it’s the easiest way to do it for me. The “Melo Jacket” is a cool jacket with hoodie add-on that was originally only supposed to be a male release but at the last moment Native Urban was able to update it with a fit for Maitreya so I chose to wear both of the new releases for the body because to me they looked great together. The amount of customization in the All Colors pack makes it so easy to come up with just about any combination you can think of with the colors provided. With the weather starting to get warmer though I’m glad I quick snuck this one in before the bug to wear more shorts and t-shirts. Jeans are a staple in every wardrobe and it could be said that you can never have enough jeans (I’ve said this before) and it is true. There are so many types that you can fit a style to whatever you are wearing and not even feel any pressure about how you look. The “Rollup Jeans” are a denim version of “The Rollup Pants” which were a previous release not too long ago. There is a good selection of denim colors that I’ll go into when I list the features and it is practical that if you’re interested in more than one color that the All Colors option will put that styling power into your virtual hands. 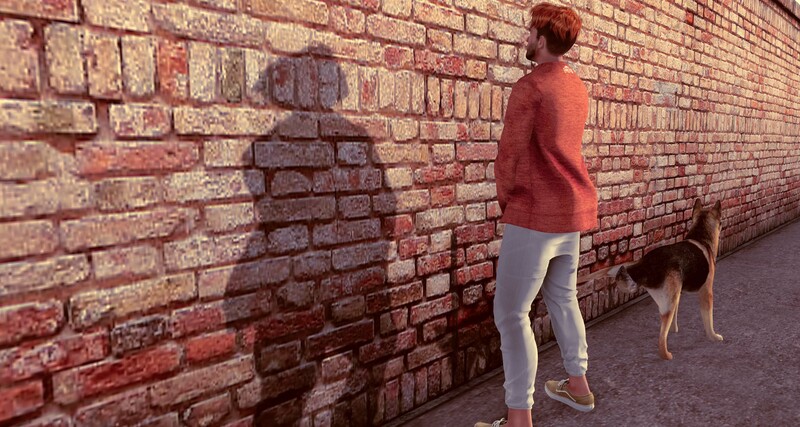 I hope that you’ve all enjoyed the great items I’ve featured in this post, I try to bring some of what I think are the best things about Fashion and Shopping on the Second Life grid to anyone who might visit this website. I try to stay as informative as I can and that way you can take that knowledge with you and use it however you like. On that note I shall bid you a fond farewell for this time and see you all again on the flipside! Welcome back to my continuing coverage of Skin Fair 2019, in today’s entry I am featuring a shape from Gloom for the very recent LeLutka “Guy” head as well as a new facial hair from Mister Razzor. Strap in your seat belts and make sure you’re ready because I’m about to take you to more fun items from the biggest avatar modifying event on the grid. I’m going to start off with the “Vic Facial Hair” from Mister Razzor, which I have to say personally that I like the life like look of this stores beards. There are three different styles for this release each of them with an applier for basic black and tintable (for the blondes, browns and gingers out there). For this entry I am wearing version #3 with the black applier. Having facial hair is something that I feel is a part of who I am both virtually and in reality and when I don’t have it I feel a little naked. There are many out there who feel the same way and I soundly encourage you fellas out there to check out this beard. Gloom is a brand that I’m rather familiar with as they work with another event that I blog for but mainly release eyes for it so it’s pretty cool that for Skin Fair they have released several different shapes (2 male and 1 female) and since I am wearing the LeLutka “Guy” head, I have combined it with the “Castelli” shape. I really like the how they bring about the features of the face to the point where I likely wouldn’t tweak anything (as the shape is modifiable). Keep in mind that not everyone is the same height or even width on the grid so making adjustments to that is possible also. E Storm has two new items that just hit the shelves of The Men Jail that just opened up on the 8th! The double release is part of an ensemble called “Maxim” and consists of a shoulder draped shirt (more like a sweatshirt honestly) and jeans. The shoulder shirt has 3 pack options each with 6 colors each and the pants have 14 different denim options (I am wearing Torn 2); both products have a FATPACK option to them if you just can’t decide which one you like best. The shoulder shirt allows for me to show off my upper physique a little better and with all this blogging I have been doing lately it is sure paying off. It’s almost a workout in itself sometimes! My excitement level has gone up a notch because lock&tuft have just released a new beanie/hair combination at Equal10 that bears my name! That’s right, the “Brennan Hair” is named after me and comes with a HUD that has 9 different hat collars. There is also two versions each having a different patch in the front which is super cool. 150 hair colors are at your disposal between the 5 different color HUDs included in the FATPACK which is what you get with every lock&tuft release. This store doesn’t play around let me tell you that. The hair is a great value and also made very well which is something you will see more and more when I feature the store in my posts. I really love how the photos turned out and am stoked full of energy about the things I’m discovering from Skin Fair as I know many of you are since it’s now been open for two days. There truly is a bit of everything there for the gals and the fellas which means that I need to really kick this post into gear. On that note I am going to wrap this up and start setting up the next thing photo session. I hope you are enjoying my coverage of Skin Fair as much as I am as there is a lot more to come in the next week and then some. On a non blog related note I hope you all take care of yourself and those close to you because this is all we got and once it’s gone there’s nothing that can change how we’ve traveled through life. Be good and be good at what you do; catch you all next time! While it’s been some time since I last posted a blog with a pose set from Image Essentials, it was time to get back in the saddle and show some love to a brand that has shown their loyalty and love for what I do in many ways. In the upcoming year I will make sure that this brand sees that loyalty returned in whatever way I can possible. Before I get into anything I want to give a shout out to the owner and creator of Image Essentials, Kay Weston. Right now she’s on a small hiatus from creating to take care of some real world things and I wish her nothing but the best and hope that she’s back to doing what she enjoys and that many of us on the grid enjoy in her work. I‘m going to start out with a prop and pose set by Image Essentials named “Tambourine”. From the moment I saw it thoughts of the song “Mr. Tambourine Man” came floating into my head and most people are most familiar with the version that was recorded by The Byrd’s but I decided on the original by Bob Dylan as it seems to speak to me more and is far less played compared to The Byrd’s. Each tambourine includes a pose that is triggered when you wear it and also has twp ribbons that can be recolored by a script inside with 4 different colors in which to choose from (Blue, Gold, Green and Red). The colors can be mixed and also matched depending on the desire of person using it. Though the best part of it is that it is intended for female avi’s but I have shown that males can also use it without any major adjustments unless the avi is aggressively muscled. I greatly enjoyed trying out the different poses in this set until I found the exact one that fit visually with what I wanted to do; I highly encourage a stop to the Image Essentials store for this prop and pose as well as many other great ways to create impactful photography/art. Moving from Poses to Hair, the Access Event is the place where the “Ash” hair by Modulus can be found and one might say that it has a slight similarity to the “Owen” hair that I recently blogged but I can tell you that they do have their differences, the most obvious is length as “Ash” is a little longer in how it hangs down on the face. There are varying little wisps as well that make them able to be told apart from the other. The shorter and mid length hairs that Modulus has been releasing lately has me thinking that having my hair longer is not as important as it once was; I think if they can make me look even remotely as good as the compliments I have gotten then the same can happen for anyone that visits the Access Event to try it out for themselves. As the year gets closer to a close, in my observation is that Modulus has grown from where it had been in the start of the year and progress like that is what helps a brand thrive and survive and I don’t think that it has to come from just my mouth but also from the countless fans of the brand (such as myself) that cannot wait to see what is in store for 2019. FaMESHed may have closed its doors but my wife and I managed to get in before it did where she pleasantly surprised me with the gift of the Ascend “Jamie Over Shirt” Fatpack that I had been eyeing for quite a while. I am a huge fan of wearing long sleeved buttoned shirts over regular t-shirts (most of the time graphic ones) quite often especially in the colder months. Wearing a regular t-shirt is not as enjoyable when the temps are lower and I’m sure many who in the real world can attest to that live in cold weather states. In the virtual world I like to wear clothing that I could see being comfortable in outside of it and this fits that description to a tee (see what I did there? 🙂 Ascend fatpacks are full of different color choices and in this case shirt choices as well as graphics that the level of visibility can be changed which is one of the things I look for. Available soon in the Ascend in-world store. I‘m starting to do the count down to New Years and with tomorrow being New Years Eve, I am going to try my best to get one last post to close out 2018. Just in case I am unable to connect with everyone out on the world wide web, I thank all the visitors (especially repeat visitors) for taking a look at what I consider to be fashionable as well as putting my artistic eye to the test. My apologies for not being the best at closing out these things but it’s just another thing for me to work on in 2019 and I’ll see everyone soon (maybe even sooner than anyone anticipates). When on a roll the best thing to do is not to question things and just keep it going and so I am posting my second straight seasonal winter photo but this time I am not alone. I brought my wife along for the ride to watch me do crazy dumb stuff and hopefully not kill myself (which includes sledding off of a hill). We visited the wonderful location of Mesmeric Cove which is a seasonal sim run by two of our good friends, Yoshi and Duckie. I was already in the winter mindset and also had some fun things from The Men Jail that I thought I would feature so let me get started on that. Kaju will be releasing the “Magnus Sweater” this weekend as part of the event and for anyone that is a fan of bulky, warm, sweaters this is the perfect thing. It has that cozy feel to it and is definitely something that would keep the body warm on a cold day (providing you have another shirt on underneath because trusting cold weather is not a smart choice). There are plenty of options to choose from included in the FATPACK and this is sure to brighten the day of anyone who might happen to be an ugly sweater enthusiast as there are some really fun designs that can be purchased together or separate. Playing outside is usually a past time for kids but I can’t help myself with the “Sleddin Around” prop and pose set by Urban Mind Poses. This is the same store that made the Rhapsody Poses that I blogged from last months TMJ event and really liked and this set isn’t any different. It’s a lot of fun with a great set of poses and mesh sled that allows for fun winter photos like what I did in this blog post. I’m fairly certain that after hopping that cliff my wife thinks I’m surely done for but most of the time I tend to land the right way which will allow me to have fun and blog another day haha! The last part of my haul for The Men Jail as it relates to this post are the “Drama Set” eyes by GLOOM. This is my first experience with the brand and while it is sometimes difficult to blog things such as eyes I hope that the closeup I captured helps you see that these eyes are pretty cool. One of the toughest things about eyes is making the choice of what color iris to wear and since this is a winter photo I ended up going with grey, it just seemed fitting to me. These eyes are really detailed and they have to be seen for themselves honestly as I’m not even sure that I’m capable of capturing them but I certainly tried my best and I can say that with assurance. That is just a little taste of what is in store for those who come to visit The Men Jail event which starts tomorrow. There are plenty more goodies from it that I’m excited to show over the course of the event in upcoming blog posts. I hope it motivates readers to take a look at what is available because I truly think there’s something for everyone at this event. I’ve spent a bit too much time now with the this entry and the last outside so once again I’m going to get a warm beverage and spend time by the fire with my favorite person and start planning on what to do next as I search for the next conversation. Hope everyone has a great start to their weekend! I want to start out this entry by wishing everyone who comes across this in the next day or so Happy Thanksgiving. This year has had its share of ups and downs but the one thing that remains for me is that I am thankful for all the good things and people that have come into and have already been a part of my life. This is the easiest part of the year to express that gratitude because it just flows into the air. While most of my US based friends and family are celebrating today, I also am thankful for my people all across the world which includes places such as Canada, Denmark, England, the Netherlands, New Zealand, the Philippines, Scotland and some places I might have forgotten. It makes no difference where someone is from but it is the feeling of comraderie that makes everything feel right. This applier is really the perfect start to putting together a scene featuring a creature of the night (which goes along with my binging of The Vampire Diaries as well). The Level event has a few days left and I want to focus on the “Nathan” hair by Modulus. It’s a short style that has a spiked feel to it but it’s not aggressively so that the hair sticks straight up because there’s so much mousse in it to choke a horse. It has that vampire feel to it as it is somewhat reminiscent of either Edward Cullen (Twilight) or Stefan Salvatore (The Vampire Diaries). As far as styling myself to have that kind of dreamy vampire look I think I handled it well and I don’t feel like there were any complaints from my wife. Man Cave is hot for the month of November and for the first time in their lineup the unique style of Bakaboo graces the event. I’m really excited to see this brand here because it is a big event and more people should become familiar with what Ocean Blackthorne does as his sense of colorful style and designs really brighten up fashion (in my opinion of course). The “Chris Vest” is a shirt/vest combination that has lots of different choices between the two different color shirts to the 3 different pattern HUDs for the vest. There is a style for just about anyone and I chose to have more of a subtle and minimalistic approach by going more monochrome with the vest. I usually choose vibrant colors in the outfits made by this brand but I felt this was the way to go. Exclusively @ Man Cave until December 9th! The glue that brings this together is the “Wicked Hunger” pose from Image Essentials and while this is not a brand new release it is one that I’ve wanted to blog for a while and thought that with all these other elements in play that no time was better than the current. My wife happily agreed to pose with me and I think that it turned out great (that may sound biased but I believe it to be true). With the help of the LeLutka Face HUD which works just as great with CATWA heads as it does their own branded heads, I was able to raise my eyebrows and make a vampire face with ease. I also made use of the CATWA teeth add-on that is available at their store and has many options to create a similar vampire look or different ones based on other creatures with teeth. This was one of the bigger blogs I’ve had lately and have included both mine and my wife’s credits so if there is any part of her look that someone finds appealing they can easily find it on the grid. She is wearing the “Yvonne Dress” from ViSion that is exclusively a part of Collabor88 for the November round. The backdrop we have behind us is the “Salem Street” backdrop by Paparazzi which helps add to the overall mood of the scene. I’ve enjoyed being able to bring you something new on a day that celebrates being thankful and I am also thankful for anyone who has ever visited this site, left a comment, faved a post or has found something they liked because I wore it or had it as a part of my scene. This is how I will leave this to go enjoy time with those who mean the most to me and may all be well with the visitors of this website until the next conversation. Continuing with my latest series of light and feel good photos, I didn’t have my soundtrack for this blog until after I finished taking the photos for it. Sometimes I will just search on Google for songs that relate to an emotion and see what pages come up and listen to some of the results. This time I did a search for “songs about celebrating a relationship” and listened to a few selections but nothing could beat “The Luckiest” by Ben Folds. I’ve been familiar with Ben Folds music for decades as he’s been a solo artist as well as part of a quintet (Ben Folds Five) and some of his songs are nerdy but a fair amount of them really pack an emotional punch and that is what this song does. If anyone that does read this clicks the links to the videos that I post the links to in the quotation at the top you will know what I’m talking about. This song makes you think even with it’s quirk towards the end it is definitely a song that fits my search. The “To Us” pose by Image Essentials is a good representation of celebrating a relationship between two people. A longing gaze from the gentleman as they both toast their happiness with on another is a special moment and a fine depiction. I had to make a few adjustments with my pose but little needed to be done otherwise. The props with the couples pose (the chair, two glasses of champagne, and the champagne bottle itself) are nicely done should definitely be looked at by any couple that wants to take a portrait to hang on the wall. 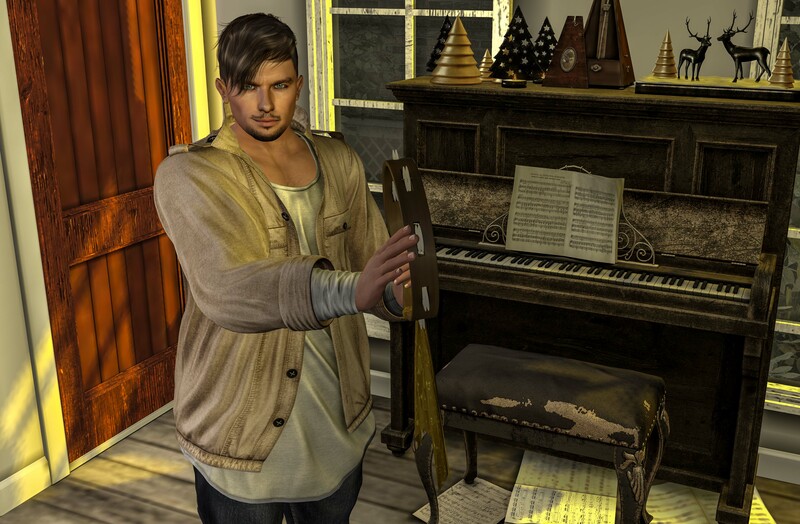 Hot off my previous blog where I featured the first of two new hair releases by Modulus from the 2018 edition of Hair Fair, I am rounding out the coverage for the store by wearing the “Elijah” short hair. I chose to use the same hairbase with this hair to add some depth as well. Compared to the Fraser hair I had on in the previous blog, this one is much shorter and a bit on the curly side as far as I can describe it to you; plenty of colors to choose from as always with Modulus as well. With four days left of this year’s Hair Fair to go…if you haven’t checked it out yet then what are you waiting for? Exclusively @ Hair Fair until October 7th!!! The two above things are main features for this blog but I have to give mention to the recent BlankLine release from the September round of The Men’s Department. I am wearing the “KnitVestShirts” which I feel is a classic look and best fit the scene I had in mind when I was brainstorming it. I chose to go the FATPACK route with this because I wasn’t sure what color style I liked and having all the options (being able to color change the shirt, vest and tie allowed for me to come up with exactly what I wanted). With more to come to the pages of this site I am going to thank those of you who visited and anyone who follows me on any of the social media outlets, it really is humbling hearing from those of you who I have never met talk about things I’ve posted. This blog is not just for me and anyone who has felt any of the feelings that have been expressed or have become inspired by the images or words, this is for you too.